Since the 1940s The colourful Buzzy Bee has clicked and clacked its way through our homes to the delight of thousands of children. 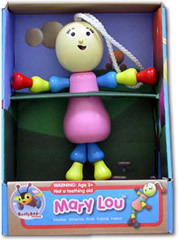 Now Buzzy Bee is bringing some of his old friends along to join him in all the fun including Mary Lou, Oscar Ostrich.Let your children explore the colourful world of rolling downs with Buzzy Bee and his friends. Buzzy bee is a real adventure of colour, sound and movement and is a favorite icon of New zealand. There is now a television series starring buzzy bee and it is already out on video and growing fast in popularity. 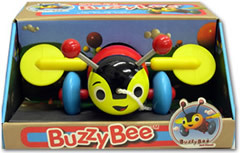 You cant buy a more authentic New Zealand Gift than the Buzzy Bee. 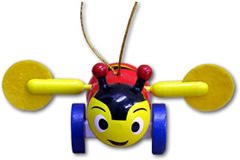 The original genuine Buzzy Bee toy! When pulled along the wings spin and a sharp click clack noise is heard. This is just an ornamental wooden toy and does not click or spin like the original. Measures 8.5cm wide x 6.5cm length.